UMX Nylon Braided String, Elastic Cord, Cotton and Polyester Wrist Strap, Ring, Web Bracelet, Wristband Lanyard or Leash Material Views. The most popular material used to make round o-ring style of wristbands, wrist rings or wrist band straps are braided nylon string, elastic cord, flat woven cotton straps, silicone, or heavy duty polyester woven webs. The following photo will show you more detail view of the material, size and colors available to make your wristband, wrist ring, wrist strap, web bracelet or wrist web band. Any custom size, length, material, hardware attachment, custom logo and custom imprinted web wristbands, wrist rings, web bands or straps with personalized and customized message are welcome! 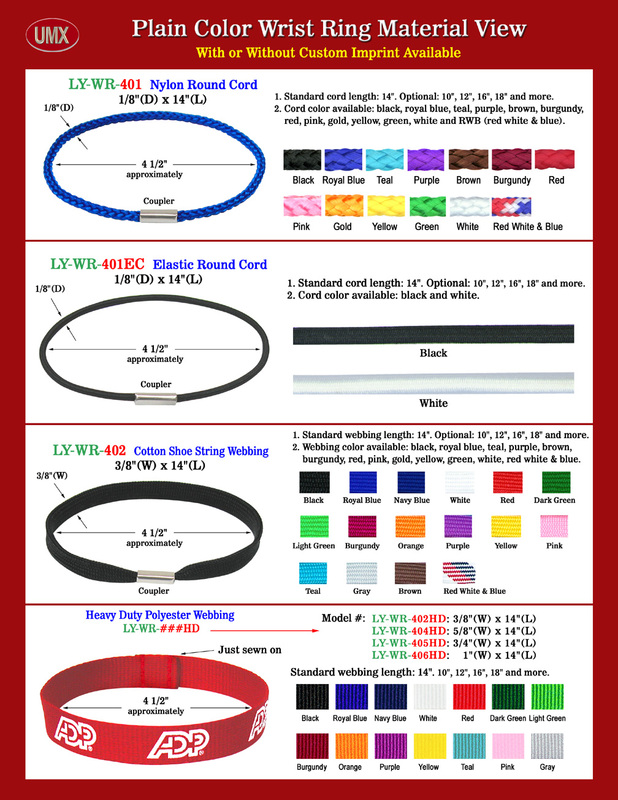 Available colors of round o-ring wristband, wrist straps, bands, rings, lanyards, leashes or web bracelet. 2 color available: black and white colors, other colors - call . LY-WR-402: 3/8" cotton shoe string webbing. 16 color available: black, white, royal blue, navy blue, yellow, red, orange, brown, pink, burgundy, light green, dark green, purple, teal, RWB and gray color. 3/8", 5/8", 3/4" and 1" heavy duty polyester plain color web strap wrist rings. PMS custom color: round cords or flat web straps: minimum order 3000 pieces + $0.10 /each. Standard cord or web total length 14"- before assembly. Optional: 8, 10, 12, 16, 18, 20 and more. You are viewing Lanyards > Leash > Wristbands or Wrist Straps > Nylon Braided String, Elastic Cord, Cotton and Polyester Wristband, Wrist Strap and Round O-Ring Band Style Lanyard or Leash Material Views.